( $19,120 in equipment the boat is FREE ) see below for just some of the main items and cost justification. 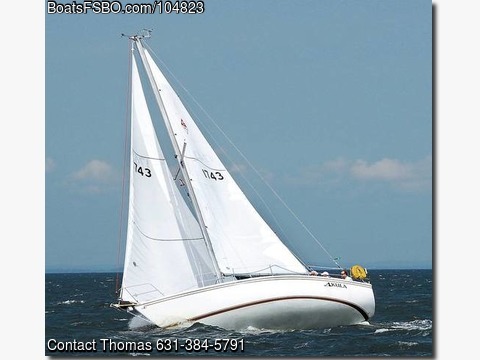 Hundreds of pictures of the boat in action, equipment, layout, interior, exterior, maintenance, upgrades, repairs, racing awards......... http://www.l-y-n-c-h.com/AKULAFORSALE/ (hyperlink above; if typing it is case sensitive) Engine Upgraded & repowered 1996 w/ Universal Diesel M-18, new exhaust pipes 2018, has Martec 14" folding prop, 1,243 engine hours as of 9/1/18 Electronics & Electrical ( $ 8,880 in major items @ replacement or used costs estimate) --- B&G Zeus Z8 MFD/GPS ($1,500) on helm in NavPod enclosure with swivel base ($340), B&G Zeus Z8 Touchscreen at Nav Station B&G Sailing Software with laylines, set and drift; Fish Finder/Sonar ($1,700) , Four (4) Raymarine ST70 MFD on an instrument arch over cabin ($800 used) Raymarine X30 Autopilot ($1,000 used) Raymarine fluxgate compass ($165) , SimRad GPS GS25 antenna ($200) , NMEA 2000 throughout ($450) the Standard Horizon Spectrum+ VHF Receiver with RAM Mic at the helm DSC/SeaTalk networked ($350 used) . Airmar wind ($300 used) , Airmar depth ($65), Airmar speed/temp ($110), Seatalk, / NMEA 2000 bridge ($ 150 used), Stereo and 4 speakers, Boat rewired and new AC/DC Panel ($750), dual 500 GPH automatic & 3000 GPH backup float bilge ($250), LED Running and Anchor lights, Red/white interior lighting, DVD/TV with Hinkley hoop passive TV antenna at masthead ($150 used) . 120 Watt flexible solar panel with dual battery MPPT controller ($250 used) , 2 group 29 deep cycle batteries (1 house, 1 engine) with Blue Sea dual battery combiner and Automatic Charge Regulator (ACR) ($350) Running Rigging ( $ 4,015 in major items @ replacement or used costs estimate) ----- Garhauer Marine - Rigid vang,($320) soft backstay adjuster, adjustable side cars ($375) , 8 clutches ($420) Oversized flat traveler w/ 5 to 1 mainsheet controller ($650) , baseplate blocks for all halyards ($450) , outhaul, jiffy reefing, self tailing ST40 Lewmar winches ($1,800) Standing Rigging Forestay, backstay, upper stays, fore and aft lower stays all replaced with upgraded turnbuckles in 2007; Low stretch high quality main, jib, and spinnaker sheets with reserve and spare cordage; Excellent quality main, spinnaker, and two full hoist jib halyards. Sails & Equipment ( $ 6,225 in major items @ replacement or used costs estimate) ---- Neil Pryde Mainsail loose foot, full battens ($ 975 in 2010) & Neil Pryde 155% foam luff Genoa ($1,800 in 2011) with new UV cover (2018), Sheaffer 2100 furling system ($2,800), Forespar 12-22 foot whisker pole ($450 used) , & 12 foot x 3" spinnaker pole ($200 used) , radar reflector, Maga Catalina grille with regulator and utensils Hull & Miscellaneous Hull is free of blisters and epoxy barrier coated. Steering is tight and firm, pedestal rebuilt and secured. Six of eight portlights were professionally UV sealed and do not leak. Two fixed portlights were replaced with Lewmar # 2 opening portlights. 35 lb Delta anchor with 32 feet of 5/8 chain hi-tensile chain and 2 x 250 feet of rode. Also a Fortress Guardian FX-11 anchor. Berths/seats covered in mat cushions.